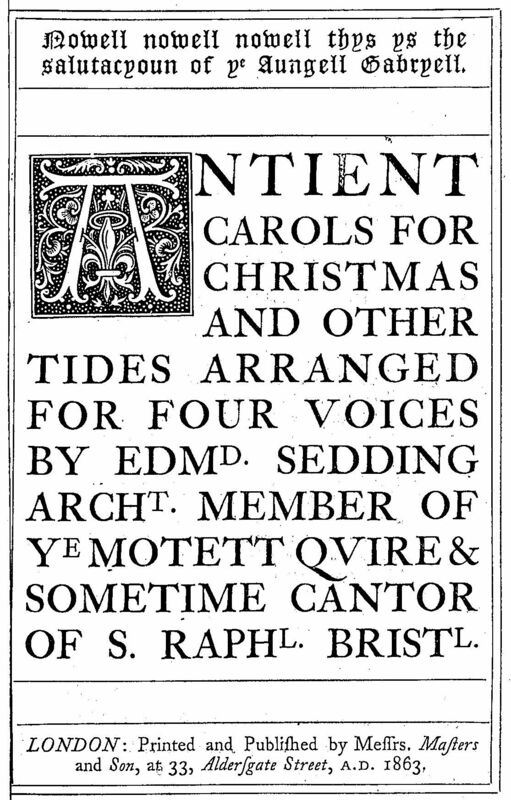 Antient Carols for Christmas And Other Tides Arranged for Four Voices by Edmund Sedding. Second Edition. (London: Masters and Son, 1863). Edmund Sedding (1836-1868) published three series of carols with substantially the same title. At this time, we only have the Second Series, but we are attempting to collect the First and Third Series on Inter-library Loan. "Done into musick of four parts by Edmund Sedding, member of ye Motett Quire." Preface contains historical information. Sedding included one carol by William Chatterton Dix in his Third Series, #9, Yule-log Carol, Glad Christmas Tide Is Come Once More. The two would have been acquaintances; born within a year of each other, they were both members of St. Raphael the Archangel Church, Bristol. Note. The Church of St. Raphael the Archangel formerly stood on Cumberland Road, Baltic Warf. It was closed from 1878-1893, sustained damage during World War II, and was demolished in 1954, except for part of the West Front. Source: ChurchCrawler, Bristol Cathedrals, Churches and Chapels <http://www.churchcrawler.co.uk/pmdraper10/bristol1.htm>, accessed January 16, 2018. Edmund Sedding (20 June 1836 - 11 June 1868), architect and musician, son of Richard and Peninnah Sedding of Summerstown, was born near Okehampton, Devonshire; the noted architect, John Dando Sedding, was his younger brother. He early displayed antiquarian tastes, which led to his visiting cathedrals, abbeys, and churches in England and France. He began working as an architect in 1853, obtaining a large practice after moving to Penzance in 1862. He married, on 18 Aug. 1862, Jessie, daughter of John Proctor, chemist, Penzance, by whom he left four children, including the architect E. H. (Edmund Harold) Sedding, who published several volumes concerning architecture. Sedding was a performer on the harmonium and organ, and an admirer of ancient church music. He was for a time precentor of the church of St. Raphael the Archangel, Bristol, and organist of St. Mary the Virgin, Soho. He greatly exerted himself in the revival of carol singing, and his books of Christmas carols were very popular. In 1865 his health failed, and he died at the early age of 32 at Penzance in 1868. ‘Antient Christmas Carols,’ First Series (9 Carols), 1860. ‘Jerusalem the Golden: a hymn,’ 1861. ‘Antient Christmas Carols,’ Third Series (9 Carols), 1864. ‘Five Hymns of ye Holy Eastern Church,’ 1864. ‘Sun of my Soul: a hymn set to music in four parts,’ 1864. ‘Litany of the Passion,’ 1865. ‘The Harvest is the end of the World,’ 1865. ‘Be we merry in this Feast: a carol,’ 1866. To F. G. Lee's ‘The Directorium Anglicanum: Being A Manual Of Directions For The Right Celebration Of The Holy Communion,’ 2nd edit. 1865, he supplied fifteen quarto pages of illustrations. Source: Sedding, Edmund, Dictionary of National Biography <https://en.wikisource.org/wiki/Sedding,_Edmund_(DNB00)>, accessed Dec. 18, 2016. "A Collection of Antient Christmas Carols. Arranged for four voices by Edm. Sedding. (London: Novello, Masters.) The best account that can be given of this seasonable little work is in the words of its compiler. It comprises, he says, melodies and words chiefly composed and in use since the time of the Reformation, and it will be matter of congratulation to see how simplicity of construction, quaintness of expression, and the grand conception of sterling Catholic truth have never been allowed to die out in these compositions. Of the nine carols that it contains, five are English, and most of them are from the "Ancient Christmas Carols" published several years ago by Mr. Davies Gilbert; three are "Noels," used in the Cathedral of Chartres, and one is from Holland. English words have been supplied by the Rev. J. M. Neale, the Rev. F. G. Lee, and W. Morris, Esq. The Dutch carol, entitled "Our Master Hath A Garden," is a very pleasing melody, which is suited for all seasons of the Christian year; the English words have already appeared in the "Ecclesiologist" for February, 1856."